The best way to find the right bike for you is to do some research on models you like. Then verify their size to your body and test riding your choices a lot. With so many choose, how do you make the best use of your time while test riding these bikes? Read on for a complete list of how to test ride efficiently. Any good test ride begin with research. First, review what type of bicycle you would like, then check out the websites of some popular brands. Pay close attention to the prices of each bike and what it buys you. A few things to look for are, the amount of gears, what type of suspension it has, tire size, frame material, and brake type. Once you have gotten a general sense for what is available, you can plan a trip to the bike shop. Before looking further call a shop closest to you and verify they have the models you want to test ride. Once you have researched a few bikes you like, give some local dealers a call. Most brand’s websites have a dealer locator to help you find the closest shop. Give a call to the shops closest to you and verify they have the models you want to ride. Because shops can’t stock every possible model in every possible size, call to ensure they at least have the right model in a size that is close to what you are looking for. Check the weather and your schedule, then pick a good time to head into the shop. Keep in mind that shops and roads are less busy during the work week. Therefore, Monday thru Friday is the ideal time to test ride bikes. If you need to go in on the weekend, call the shop and see when they are least busy and make an appointment if possible. It makes no sense to test ride bicycles if you are not dressed for the occasion. Wear your Jersey, Shorts, bring your helmet, and bring shoes and pedals if you ride clipless. Another helpful thing is to bring your existing bicycle with you. The way your current bike is setup can be replicated somewhat for test rides. When test riding bikes, you are potentially borrowing thousands of dollars from the shop. Therefore, it’s expected for shops to ask for some form of collateral. At the minimum, bring your ID and a major credit card. Test rides don’t need to take hours, but a three minute spin is rarely enough time to make a real impression. Expect to take at least 15 minutes on each bike, with more time spent on the first few bikes you ride. When riding, try to focus on how the bike accelerates, how easily it changes direction, and how stable it feels. A great way to do this is to pick a set route that has some flat area, some climbs, and at least one good descent. Riding the same course with different bikes makes comparing them easier. Once you get the feel for a few bikes, you can start narrowing down your choices. I find it best to pick two and then ride them back to back, concentrating on fit and comfort rather than speed and stability. Have the shop begin dialing in your fit on these two bicycles to see which one really is the best for you. Once you have a bike that rides well and fits well, you are ready to buy. A bike that rides great is the key ingredient in a great bike ride but it’s not everything. Remember that your new bike needs things like a water bottle cage, kickstand, lights, and maybe clipless pedals or a better fitting saddle. Consider all the situations you may run into on your new bike and buy the products you need to be prepared. 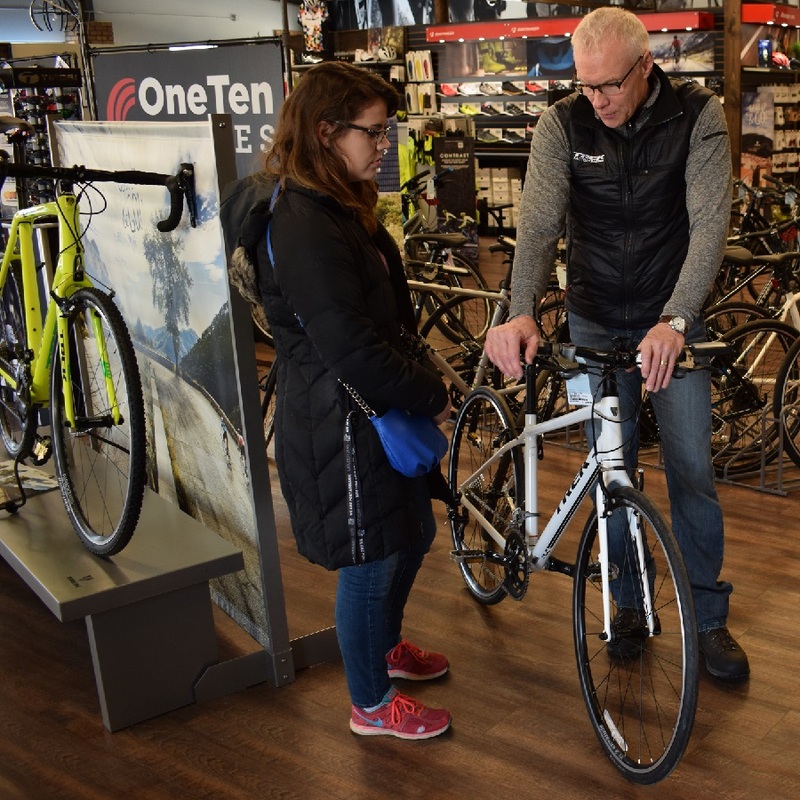 This entry was posted in News and tagged #bicycle, #FindYourNextAdventure, #trek, Bike Guide MN, bike shops, cannondale, felt, fuji bikes, giant, hybrid, kids bike, kids bikes, mountain bike, new bike, next bike, road bike, specialized, test rides on April 15, 2018 by John Brown. Shift gears to the terrain you are riding can take you miles from home with ease. Over hills and through tough valleys, all thanks to the ability to know how to shift your gears. Learn the what, how, when and why of shifting your bike below. Before we jump into how to shift your bike most efficiently, lets cover the basic parts. Beyond the chain, there are many moving parts that make up the drivetrain on your bike, allowing you to shift gears. 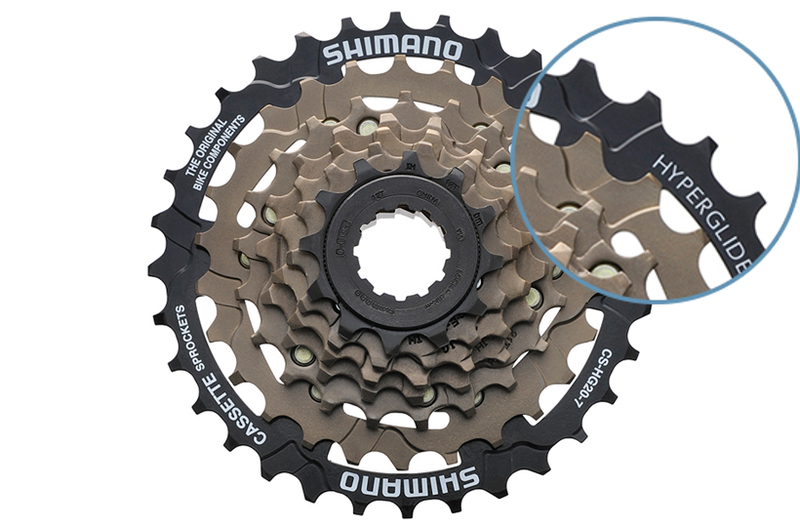 The gears attached to your rear wheel are called the cassette or freewheel. While they are mechanically different, for the act of shifting, they operate identically. These gears are built with teeth that sit higher, lower, or at an angle depending on where they are located. The different tooth profiles allow the chain to seamlessly shift from one gear to the next. These gears come in groups of 5 up to 12 depending on the shifting system you have. Overall, the smallest and largest gears are close in size regardless of the amount of gears. The chainrings are the gears attached at the middle of the bike where your pedals are. Most bikes have between 1 and 3 chainrings. You will notice that the teeth on the chainrings have similar profiles to those on the cassette. So if you see a tooth that is smaller or oddly shaped, don’t immediately assume it’s damaged. Basic chainrings will be stamped out of steel while more expensive ones are machined out of aluminum. The machining makes these aluminum rings both lighter and shift better. The derailleurs are the mechanisms that physically guide the chain from one gear to another. Most bikes will have two, a front and a rear. The front derailleur has a curved cage that sits just above the chainrings. When moved in and out, that cage guides the chain onto different gears. The rear derailleur has a parallelogram, and a spring loaded arm with two pulleys. When shifted, the rear derailleurs upper pulley guides the chain across the cassette and onto the appropriate gear. The shifters are designed to pull the cables that operate the derailleurs. Most bikes have them attached to the handlebar, but some older bikes will have them located on the downtube. The shifter on the right side of the bike controls the rear derailleur while the shifter on the left operate the front. For mountain bikes and hybrids there are really only two types, trigger and twist shifters. A trigger shifter uses thumb and trigger finger activated levers, while a twist shifter allows you to rotate a portion of the grip to shift gears. Road bikes usually have the shifter mounted onto the brake lever, but can also have paddle style shifters on the end of the bar or on the downtube. Road bike shifters are usually attached to the brake levers (left) but on older bikes can be found on the downtube. Shifting your bike is easy to do and easy to do wrong. 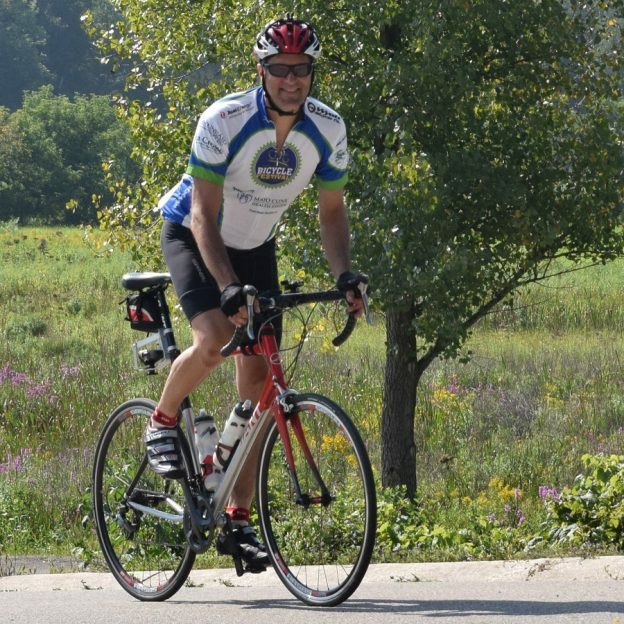 For all bikes that use derailleurs, remember one thing – Shift only when pedaling. The act of pedaling is what allows the chain to jump seamlessly from gear to gear. Also try not to shift both the front and rear derailleur simultaneously as it can lead to problems. To get comfortable shifting, pedal on a piece of flat ground and operate only the right (rear) shifter first. You will find that as you shift into higher numbers (assuming your shifter has a gear indicator) it will become more difficult to pedal but faster moving. Inversely, as you shift into lower numbers it will become easier to pedal but slower moving. Once you feel very comfortable shifting the rear derailleur, shift into a middle gear and explore what the front derailleur does. You will notice that the incremental changes of the rear derailleur give way to large changes when shifting the front derailleur. Going across chainrings makes a huge difference in how easy or difficult it is to pedal. Once you have mastered the front and rear derailleurs, you are now ready to try shifting in other than flat conditions. The reason we shift gears is to give ourselves a mechanical advantage over the changing surroundings. With this mechanical advantage comes some idiosyncrasies. First thing is that the gears are designed to allow the chain to move easily from one to the other when shifted, but hold tight under the load of pedaling. What that means is that if you are pedaling with a great amount of effort (say up a hill), and try to shift, you are asking the drivetrain to both hold the chain in place and move freely. Sadly, it becomes difficult for a mechanical device to do both these things. To make sure you don’t run into any issues, always shift while you are pedaling with light load, or shift into the dear you will need just before you actually need it. As an example, shifting into a very low gear at the base of a hill is a better idea than taking a run at it and trying to shift down gears while your climbing under load. When we talk about gears, what it translates to is how many times the rear wheel rotates per pedal rotation. So if you are in a very low gear going up hill, you may pedal two complete pedal rotations in order to turn the rear wheel once. Inversely, if you are headed down a steep descent in a high gear, you will probably be spinning the rear wheel 3-4 times per pedal rotation. If you think about gears in these terms, it becomes easier to figure out where and when to shift. The perfect gear is always changing (and you thought it would be easy). Even though it changes, it can most easily be described as the gear allowing you to pedal comfortably. 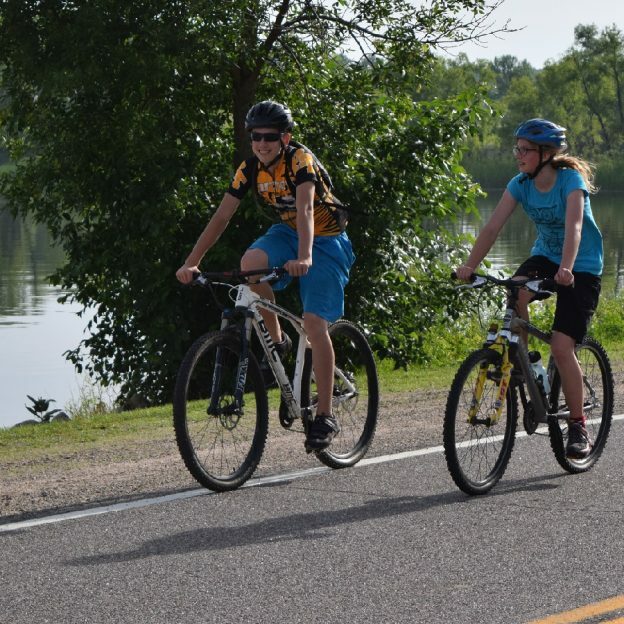 We all have a natural pace (called cadence) we feel comfortable pedaling at, the goal in shifting I to allow you to continue to pedal at that pace even as the topography changes. Now that you understand the “what, when, why, and how” of shifting, it’s time to practice on the open road. Pay close attention to what your most comfortable pedaling cadence is. Oftentimes people believe that they are comfortable pedaling really slowly in a difficult gear, but find after some experimentation, that they can pedal for longer if they shift into a slightly easier gear and pedal quicker. If you are riding off road, experiment with what gears give you the best traction on loose terrain. Many riders will default to their lowest gear at the first sign of loose conditions only to find that gear has too much torque, forcing their tire to break free and spin out. All in all, body types, muscle mass, conditions, and personal preferences make gearing choices different for everyone. But now that you know the details, you should feel comfortable finding the right ones for you. Also check out our article on related tips to make your bike more comfortable and faster. This entry was posted in News, Uncategorized and tagged #mtb, #shimano, bike, bike gears, bike shifting, downtube shifters, how to, how to bike, next bike, paddle shifters, road bike, shifters, Shifting gears, sram, trigger shifters, twist shifters on July 15, 2017 by John Brown.